EWAN McVicar can trace his musical credentials right back to the earliest days of the Scottish folk revival and the seminal Glasgow classroom and ceilidh house influences of Morris Blythman and Norman and Janie Buchan. 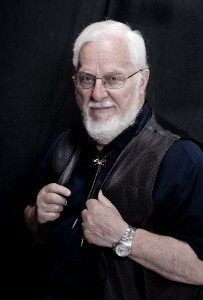 In fact his folk pedigree extends further back, as his father, Bill McVicar, was known for his singing and recitations. Ewan’s marvellously chequered early career took in such diverse occupations as banking in Glasgow and Uganda, teaching guitar in the USA and social work. It is as a tireless traditional singer, activist, songwriter, author, storyteller and publisher, however, that he has made his reputation. McVicar was born in Inverness in 1941, the family moving to Dingwall then to Glasgow, where he attended Allan Glen’s School and thus came under the influence of songmaker, poet and activist Morris Blythman, whose pen name was Thurso Berwick, and whose Ballad and Blues Club within the school fostered many a budding folksong talent. Ewan was one such, initially influenced by Lonnie Donegan and the skiffle boom of the day and then by Scots traditional song after meeting the great Jeannie Robertson and hearing recordings of Jimmy MacBeath and others at the home of MP Norman Buchan and his wife Janie. Through Janie’s encouragement, McVicar and Drew Moyes founded Glasgow Folk Club in 1959, the first club of its kind in Scotland, preceded only by Edinburgh University Folk Song Society, and which was a rendezvous for a loosely affiliated group known as the Broomhill Bums, including Josh McRae, Hamish Imlach, Ray and Archie Fisher, Bobby Campbell and McVicar himself. Blythman would tell his pupils: “Everyone in the world has at least one good song in them. Away and write your good song,” McVicar did indeed write a Good Song. In the shadow of impending National Service and under the influence of Lonnie Donegan’s Talking Guitar Blues, which was frequently performed by fellow-Broomhill bum McRae, he wrote Talking Army Blues. McRae chose it as the B side of the version of the Donegan song he was about to record, but press reviewers preferred Ewan’s song and it became the A side, spending several weeks in the lower reaches of the Top Twenty in 1960. He declined the record company’s request for a suggested follow-up, Talking Teenage Blues, but nine years later composed Dear Evelyn which was sung by a short-lived folk group of Archie Fisher, Barbara Dickson and Rab Noakes. Running in tandem with this musical activity, having left school in 1957 he worked in a bank in Glasgow, then as a youthful accountant in Uganda and Kenya – establishing a relationship with Africa which has endured – as well as what is now South Yemen. Taking a scunner to the world of finance, he escaped via the Far East to the USA, to sing and teach guitar in Colorado and Massachusetts before returning to Scotland in 1968 to train as a social worker, working from the early Seventies to the mid-Nineties in social work. In 1998, having left social work to become a self-employed storyteller, songwriter and author, he gained an MSc by Research from the School of Scottish Studies at Edinburgh University, based on his study of playground songs, documented in his 2007 book Doh Ray Me, When Ah Wis Wee. He is probably the foremost authority on children’s songs in Scotland and has frequently collaborated with the singer Christine Kydd in schools song-making projects. Other songs of his include Shift and Spin, which was adopted by Ray Fisher, and possibly his best known traditional-style song, All the Tunes in the World, which has been recorded by the late Iain Macintosh, Janet Russell, Tom McConville, the McCalmans and others. He has also provided 20 children’s songs for the Singing Kettle show (also inducted into the Trad Music Hall of Fame this year), including No Pyjamas On and Bananas Are the Best, while he wrote Who’s That Up the Chimney? while travelling on a tram in the Urals, for a Russian school who wanted a Scottish Christmas song. In the 1990s he started his own record label, Gallus, the first issue of which was an LP of Glasgwegian anthems, I Was Born In Glasgow, assembling his pals Iain Macintosh, Ian Davison, Hamish Imlach and Alan Tall. The second was a cassette album of the work of Caithness songmaker Nancy Nicolson, the third, Gies Peace, was the riotous effusions of the Scottish CND Buskers, followed by albums of songs and of stories for young Scots. More recently he edited for Aberdeen Folk Club’s anniversary a CD and book about Arthur Argo’s 1960s collecting work in Aberdeenshire. Between 2000 and 2005 he edited several albums of Scottish traditional songs drawn from the 1950s archives of the great American folksong collector Alan Lomax, for the Alan Lomax Foundation and Rounder Records, resulting in, among other things, the 2006 Rounder release of The 1951 Edinburgh People’s Festival Ceilidh. The 1990s also saw him become a full-time storyteller, at the encouragement of Donald Smith of the Scottish Storytelling Centre, which mounted a touring exhibition, based on Pictish stone carvings, which Ewan had created in partnership with Ghanaian artist Amu Logotse. He has performed widely throughout Scotland and abroad but has now retired from storytelling. Other books include One Singer, One Song: Old and New Stories of Glasgow Folk as well as Cod Liver Oil and the Orange Juice: Reminiscences of a Fat Folk Singer, which he co-wrote with the late Hamish Imlach, and he contributed substantially to Volume Eight of the Greig-Duncan Folk Song Collection. Meanwhile Traditional Songs & Music, which he co-wrote with Kathleen Campbell, became the basis for the influential website for schools, Scotland’s Songs, he created for Education Scotland (see www.educationscotland.gov.uk/scotlandssongs). Titles from his Gallus Publishing concern include The Eskimo Republic: Scottish Political Song 1951-1999 (harking back to his early mentor, Thurso Berwick) and Bonny Collier Lads and Lasses, although Gallus’s best seller so far has been a reprint of the Imlach autobiography. As well as numerous theatre works and articles for various journals and other publications, he has created some 30 small and major websites relating to Scottish traditional song and culture. He has run a festival of Scottish culture in Perm, in the Russian Urals, and continues to run charitable projects linking Scotland and Uganda, centred on music, visual arts and crafts.